Taming of the Shrew’ is the title of a very well-known and popular Shakespearean play that I studied as part of our English non-detailed syllabus while I was in the ninth standard. It is a comedy about the experiences of three friends in managing their newly-acquired brides who seem to be of vastly differing temperaments. The seemingly most unlucky man, married to the seemingly most untameable woman, emerges as the proud winner of the undeclared war of wits among the three friends. Most women and men too, except those who have studied English literature as a subject tend to think that Shakespeare wrote this when in fact it was written by William Congreve in The Mourning Bride in the year 1697 well after Shakespeare had bid goodbye to this world. But the fact remains that millions of men today read ‘Taming of the Shrew,’ the play that the Bard has written and secretly enjoy recounting how one of his characters scores a victory over his wife. This secret delight perhaps serves to mitigate in a small measure their frustration over their own failures in similar missions! The fact that this super husband was only a fictional character being a figment of Shakespeare’s fertile imagination does not make the slightest difference to their glee! Leaving humour aside and leaving Shakespeare to bask in the relief of his narrow escape, thanks to a flattering phrase which he never wrote, let us now come to the very important issue of chaotic traffic in our city that needs much taming. Over the past few days, we have been seeing much discussion in SOM about the frenzied traffic in our city. Citizens tend to blame the laxity of our Traffic Management Police and the Police in turn blame unruly drivers. Unruly drivers blame the civic authorities for the bad state of our city roads and civic authorities blame citizens for suffering this fate by not paying their taxes on time. Pedestrians blame merciless motorists and motorists blame jaywalking pedestrians. Four-wheeler users blame wriggling two-wheeler users and two-wheel users blame bull-dozing four-wheeler drivers. 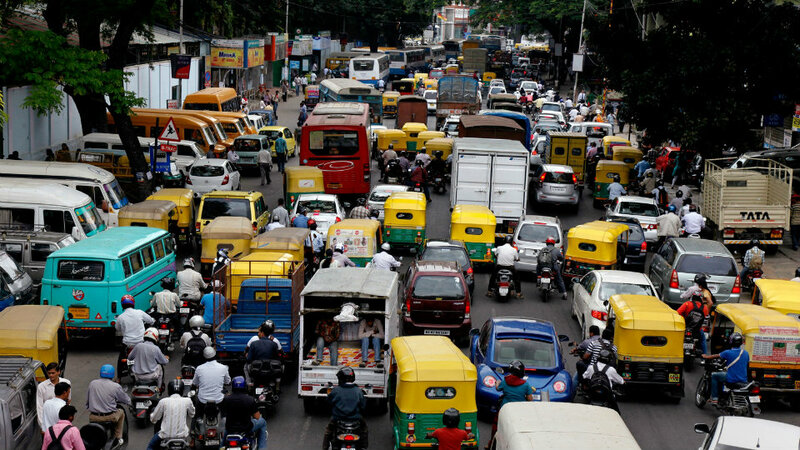 But all citizens uniformly blame city bus and autorickshaw drivers who have turned our roads into a vast arena where they can strut, grunt and glare like medieval warlords. City bus and autorickshaw drivers are such nice angels that they never blame anyone. They just have the last laugh and keep driving in their own ‘all-others-can-go-to hell’ style unmindful of all lesser mortals! But the sad fact remains that this blame game seems to be taking us nowhere, at least by road and we seem to be unable to do anything about the utter chaos that has become a nightmare to all road-users over the past few years ever since the population of both people and vehicles in our city started overflowing beyond its ability to support their presence. While there are various factors at play that have been responsible for the extreme hardship, inconvenience and frustration that we experience while driving or walking through our city one fact stands out like a very sore thumb. When it comes to needless deaths on our roads, our youngsters take the cake in being responsible for most of them with their total lack of concern for their own safety and the safety of others. Once priceless human life seems to have become such a cheap and dispensable commodity today that its worth is equivalent only to the joy that a teenaged lad gets out of doing what very often becomes the last ‘wheelie’ of his life on a busy road when he espies a bevy of girls passing by. And young girls too, unwilling to be outdone in their prowess by the boys, seem to drive their two- wheelers not on petrol but on pure adrenaline. Recently we read about a city lad, the son of very sober and responsible parents, who was nabbed by our Traffic Police after having committed eighty offences on our roads and who was let off riding his bike, after he paid just rupees eight thousand as fine. This makes very sad reading and it is a very sad reflection of our legal system which advocates penalties and punitive procedures which are not the least bit deterrent even to habitual offenders. Just imagine the arrogance and disregard this one youngster must have had in him to turn a blind eye to his own safety while he thumbed his nose at traffic signs, signal lights and Traffic Policemen and kept breaking rules over and over again. The victory he has scored over our legal system by getting away with both his bike and his licence to ride it after paying less than what he perhaps spends with his friends on a weekend in a seedy bar will undoubtedly be the topic of his latest boast. While there are many lacunae in our legal system that cannot be corrected in a hurry our Traffic Police should wake up to the reality of what is happening around them and start identifying offenders and start impounding their vehicles and levy heavy and deterrent fines. Here they should give priority in bringing to book offenders who inconvenience and endanger other road users instead of only concentrating on people who may be endangering their own lives by not wearing seat belts and helmets. Let the driver who drives through a red light, the driver who blocks others by being in the wrong lane, the driver who whizzes past you at lightning speed like an unguided missile, the driver who under the influence of drink or dope drives while he is seeing double and the rider who jolts you awake from your sleep when he drives by your house on his unmuffled bike be the ones to be roped in first! As usual Dr. Javid Nayeem’s article is an engrossing reading, this one take us around various labrynths of readership, from Shakespere to women chivanists and their rage and reprive. However, the second part of the article is worth a second glance of our city traffic vanguards and the made suggestions must be taken with equal speed as the people who use our roads as if the roads are built only of their whims. The city traffic also needs much attention by the Corporation authorities in checking fruit, chats and hosiery peddlers on the foot paths but also to widen our roads keeping with the time. Love to read anything that comes of our modern day bard.